Fadillah (seated centre) flanked by Dato Sri Wan Junaidi Tuanku Jaafar on the left and Datuk Seri Richard Riot Jaem addressing the press conference. KUCHING: There will be further discussion on setting up a committee to look into the regional issues of Peninsular Malaysia, Sabah and Sarawak. 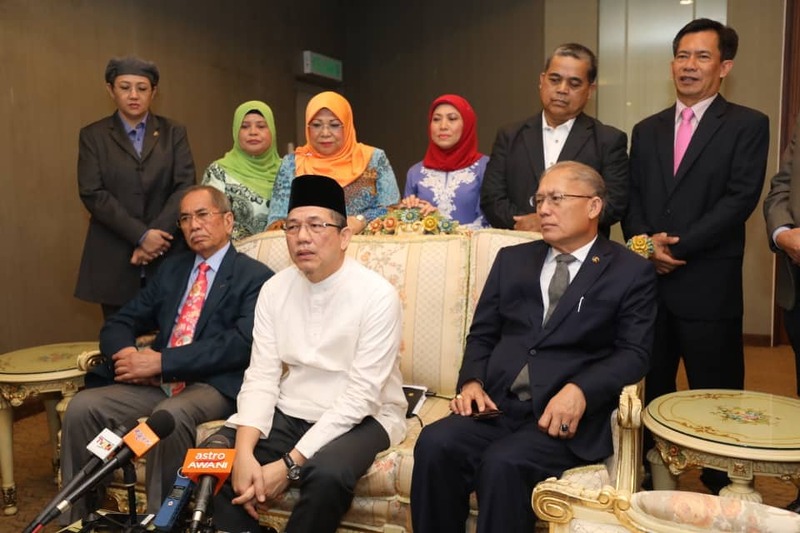 Gabungan Parti Sarawak (GPS) parliamentary chief whip Datuk Seri Fadillah Yusof said the committee is necessary in view of the issues of the three regions -Peninsular, Sabah and Sarawak- that have been raised. “The issue of Sarawak region is very important for us in Sarawak, so there will be a further discussion related to the setting up of a committee to look into the details like legal aspects and so on,” Fadillah told a press conference today after leading GPS members of parliament to meet with Chief Minister Datuk Patinggi Abang Johari Tun Openg at the State Legislative (DUN) complex. Fadillah revealed that there are “reservations” about the 20 per cent oil royalty to Sarawak as promised by Pakatan Harapan. He said the issue was also discussed during a meeting between GPS MPs with prime minister Tun Dr Mahathir Mohammad yesterday. “From the prime minister’s point of view, there are some constraints to implement the 20 per cent oil royalty,” the Petra Jaya MP said. He pointed out that the state has its own strategy to address the issue, adding that Petros and Petronas are still having discussions on the matter.